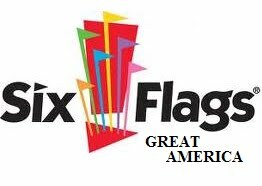 Welcome to Six Flags Great America. The first coaster of the day would be The Dark Knight. This is basically a "mouse in a box" but it is a fairly fun ride. The next coaster of the day would be Superman Ultimate Flight. This B&M Flying Coaster is always a lot of fun. I wish it would load faster, but that's just the nature of this style of coaster. This is the original Batman the Ride. It's still one of the most intense B&M inverted coasters ever built. They have a great swing ride in this area. Vertical Velocity is the park's impulse coaster. The coaster gets a little overshadowed by the bigger marquee rides. The Little Dipper is the park's kiddie wooden coaster that was transplanted from the now closed Kiddieland Park that was also in the area. Goliath is the park's newest coaster. This RMC built wooden coaster is pretty insane. This wooden coaster does things that wooden coaster are not supposed to do. The park's racing woodie is the American Eagle. This large pile of lumber dominates the skyline on this side of the park. X-Flight is the park's B&M wing coaster. This was one of the first wing coasters in the nation. It's crazy how big these trains are. I like all of the keyholes that the coaster goes through. Demon is the park's Arrow looper. Raging Bull is the park's B&M mega coaster. This coaster is the tallest in the park. While it is a mere shell of itself due to excessive trim brakes, it is still a fun ride. Fast and full of air time. The best true wooden coaster in the park is the Viper. It is modeled after the Coney Island Cyclone. I really enjoyed this ride. The final coaster of the day would be the Whizzer. This coaster holds a special place in my heart because I really miss the Zambezi Zinger. I had a great day at the park.